Swansea Historic Town site is located in western Arizona approximately 30 miles northeast of Parker. Swansea has a unique history unlike many other ghost towns. Part of what makes Swansea so unique is that it is partially preserved, meaning Swansea appears to be suspended in time. Sure Swansea doesn’t look anything like its former self, but with the help of the BLM, it is preserved in history. The story of Swansea begins in 1862. Mining and prospecting took place on-and-off until 1886, when most of the rich silver ore bodies were exhausted. Ore from this time period was transported to the Colorado River and then down to Yuma & across to Wales. In 1904, the “worthless” claims were purchased by the Signal Group. They had plans for a large scale copper mining and even a town. It was at this time, the Arizona & California Railroad had begun building a line from Wickenburg to Parker. This meant a much needed rail line was now within reach. Miner's cottages at Swansea which have been partially restored by the BLM. In 1908, T.J. Carrigan, one of the new owners was looking for investors and brought George Mitchell 21 miles to visit the claims. Mitchell, a Swansea born Welshman was impressed. By the end of the year a 350 ton capacity furnace was in place and a vital waterline was established between the Bill Williams River and Swansea. The 3 ½ mile line brought water from the river to storage tanks near Swansea. The next year, 1909 brought prosperity to the town. A post office under the name of Swansea was established. Also the population boomed to 500. Most importantly, George Mitchell had incorporated the Clara Consolidated Mining Company. The first train along the Arizona & Swansea railroad went from Bouse to Swansea in 1910. This allowed supplies and profits to be moved quickly in and out of Swansea. At its peak, Swansea boasted 750 residents as well as many modern amenities like an automobile dealer, theaters, barbershops, saloons, restaurants, a notary, and even an electric light company. The same year the furnaces had fired up and were processing copper at 50 tons a day. All of this quick success meant failure wasn’t far. Unfortunately, George Mitchell put more money into promotions rather than into improving the mining. The investors were there but producing copper at 3 cents per pound higher than the selling rate was not the key to success. This was a financial nightmare and forcing Mitchell & his company to declare bankruptcy in 1911. The mine was opened and closed on-and-off for the next few years. The American Smelting and Refining Company bought the mines in 1914. After rebuilding much of the town and opening the mines once again, they managed to make a profit for a couple years after Mitchell left Swansea in 1916. Ernest C. Lane became the new manager of the mines. The end of World War I brought a massive drop in the need of copper. The final blow to Swansea was the great Depression. With its last reported milling in 1944, Swansea had become a true ghost town. Plagued by interests from many different men, especially one George Mitchell, the town that once was a thriving mining metropolis is now one of the most interesting and mysterious ghost towns in the area. Because of preservation by the BLM, visitors to Swansea today can visit this remote town and explore it. The BLM and the Friends of Swansea, Inc. have worked hard (and continue to) make Swansea an interesting and fun place to visit. Please respect this neat town. There are many great trails to explore in the area. Use caution around old mines, although most have been securely blocked or gated. To get to Swansea, follow Swansea Town site trail: from Bouse, travel east. Follow the road as it bends north. Stay left at the first “y”. Stay left at Midway (former rail stop halfway between Bouse and Swansea) and then turn right at the 4-way stop. It’s a 25 mile trip on gravel and rocky roads. High clearance recommended – be prepared for desert travel. Swansea is also accessible via Parker using Shea Road and following the signs. Sherman, James E., and Barbara H. Sherman. Ghost Towns of Arizona. Norman: University of Oklahoma, 1969. 149. Print. Varney, Philip. 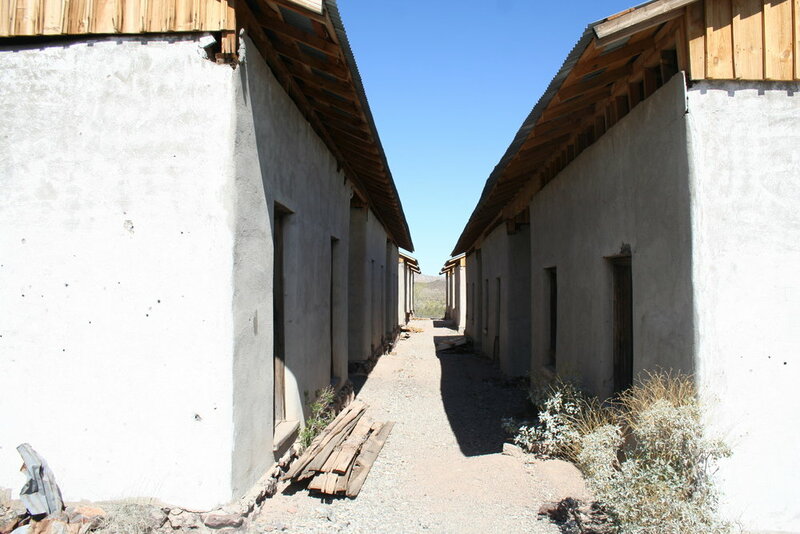 Arizona Ghost Towns and Mining Camps. Phoenix, AZ: Arizona Dept. of Transportation, State of Arizona, 1994. 48-51. Print. "Swansea Historic Townsite - Cultural & Historic Resources - Arizona BLM." Swansea Historic Townsite - Cultural & Historic Resources - Arizona BLM. U.S. Department of the Interior - Bureau of Land Management, n.d. Web. 24 July 2013. <http://www.blm.gov/az/st/en/prog/cultural/swansea.html>.